Of Mice and Men explores the dynamics of male friendship. When Lennie asks George to tell him why they're not like other ranchers, George explains that they're different because they have each other. Usually ranchers have no family, no friends, and, therefore, no future. George and Lennie's friendship strikes the other ranch workers as odd: their dependence on each other makes the boss and Curley suspicious; and Slim observes that ranch workers rarely travel together because they're scared of each other. Although most of the men in the novel are entirely alone, they all crave true companionship. As Crooks, perhaps the novel's most solitary character because of his black skin, puts it, "A guy needs somebody—to be near him." The ThemeTracker below shows where, and to what degree, the theme of Male Friendship appears in each chapter of Of Mice and Men. Click or tap on any chapter to read its Summary & Analysis. Below you will find the important quotes in Of Mice and Men related to the theme of Male Friendship. I seen it over an' over-a guy talkin' to another guy and it don't make no difference if he don't hear or understand. The thing is, they're talkin', or they're settin' still not talkin'. It don't make no difference, no difference....It's just the talking. A guy sets alone out here at night, maybe readin' books or thinkin' or stuff like that. Sometimes he gets thinkin', an' he got nothing to tell him what's so an' what ain't so. Maybe if he sees somethin', he don't know whether it's right or not. He can't turn to some other guy and ast him if he sees it too. He can't tell. He got nothing to measure by. I seen things out here. I wasn't drunk. I don't know if I was asleep. If some guy was with me, he could tell me I was asleep, an' then it would be all right. But I jus' don't know. Lichtenstein, Jesse. "Of Mice and Men Themes: Male Friendship." LitCharts. LitCharts LLC, 22 Jul 2013. Web. 7 Dec 2018. Lichtenstein, Jesse. "Of Mice and Men Themes: Male Friendship." LitCharts LLC, July 22, 2013. 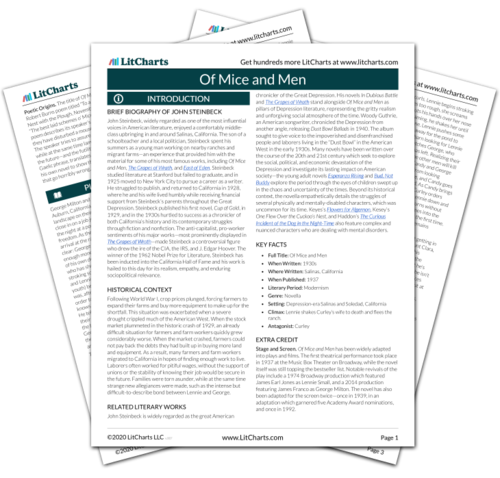 Retrieved December 7, 2018. https://www.litcharts.com/lit/of-mice-and-men/themes/male-friendship.